KCF Technologies on Tuesday announced plans for a $1.5 million expansion in downtown State College and the addition of about 100 new jobs. 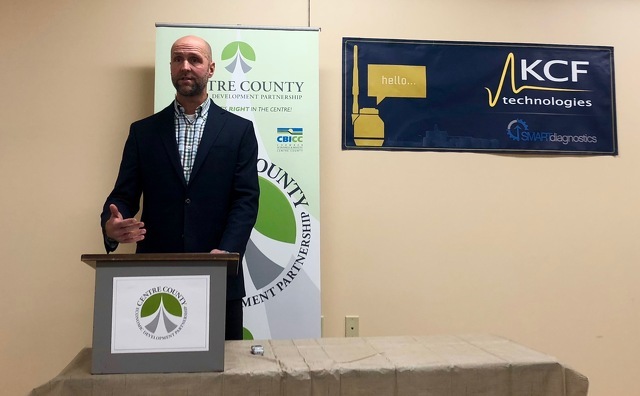 Company leaders, along with the Centre County Economic Development Partnership (CCEDP), unveiled the plans during a press conference at the Chamber of Business and Industry of Centre County offices. "Our company 'grew up' downtown, starting in an office on Foster (Avenue), and we want to keep our roots here," Jeremy Frank, CEO and co-founder of KCF Technologies, said in a press release. "The new property allows us to continue to grow without losing our connections to the vibrant downtown area. The CCEDP's partnership was an important part of that decision." KCF, which has its main offices at 336 S. Fraser St. and another suite at 141 W. Beaver Ave., plans to lease an additional 15,000 square feet of new space downtown. Frank said he could not yet reveal the location of the new space because the lease has not been signed but that "it will be in a prominent new building right in downtown State College." KCF hopes to open the new location in March and it will maintain the Fraser Street and Beaver Avenue offices. Founded in 2000 in State College, KCF "develops and commercializes products and solutions for industry and the military," according to the company. It uses technology to evaluate how various machines are running and develops solutions to optimize manufacturing. KCF recently hired its 100th employee. CCEDP municipal partners developed an investment package which will provide $150,000 for KCF's retention and expansion. Centre County will provide $50,000 and State College, College Township, Ferguson Township and Patton Township each will provide $25,000. As part of a "performance agreement" with CCEDP, KCF will lease new office space for at least five years, increase jobs in State College to 200 within three years, and maintain its corporate headquarters in State College for at least 10 years. CCEDP will work to address parking concerns for KCF's current and future employees, coordinate regulatory cooperation so KCF can move into the new space by March, and help address other regulatory permissions such as signage. CBICC President and CEO Vern Squier said the goal is not to "short-circuit" the code process but to see that it doesn't languish. "Something we’ve discussed with the Chamber is anything that can help us expedite the process is probably even more important to us than financial assistance, because we’re bursting at the seams," Frank said. "We’re in two locations and we’re crowded. We have people trying to do this innovative, groundbreaking work and they’re squeezed in like sardines." Squier also said it is not the first time that multiple municipalities have collaborated on such an investment they see as beneficial to the entire region. "We appreciate the townships for understanding they are part of a larger community here," Squier said. "Everybody’s feeding in and out of the economy in their own way, and that collaboration seemed to make sense to support this initiative." Squier lauded KCF for its steady growth, "commitment to community," and "family-sustaining" jobs it offers now and will in the future. "KCF Technologies is a true home-grown success story, evolving from a company heavy on government-sponsored research projects to one realizing tremendous commercial success with its SmartDiagnostics technology," Squier said in a release. "As the company continues to experience robust growth and expand its industrial customer base, it is of critical importance to economic growth and job creation that the company remains headquartered in State College/Centre County." Frank said that being downtown offers quality-of-life benefits for KCF's employees and that the local support of the company sends a strong, positive message to potential future employees. State College Mayor Don Hahn said the borough and KCF have had a mutually beneficial relationship. "The Borough of State College is very excited about KCF’s longterm investment and commitment to expand in downtown State College," Hahn said. "The growth will help cultivate high-quality job opportunities and create additional jobs for young professionals in State College. The borough has enjoyed a collaborative relationship with KCF Technologies and looks forward to continuing the strong relationship for years to come." About half of KCF's current employees are Penn State graduates. Frank said that as the company grows, recruiting top talent is vital and that it will be looking for "engineers with social skills," as well as a variety of other professionals in fields such as software coding, business and sales. Centre County Board of Commissioners Chairman Michael Pipe said he hopes to see similar investments in growing local companies become more common. "A message to all the other small businesses in Centre County: we want to do this again real soon," Pipe said. "We want to make this something that is routine." 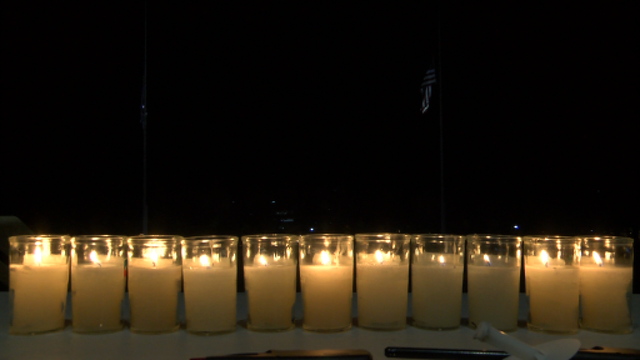 Penn State Hillel and Chabad of Penn State hosted a vigil Monday night in front of Old Main to honor the memories of 11 people who were killed in a shooting at Tree of Life synagogue in Pittsburgh.